*NOTE* Please note that this picture shows a seat that is reclined too far and improperly installed. A rear-facing car seat should never be reclined past 45 degrees; for an older child who is able to hold their head, an angle less than 45 degrees (more upright) is safer. Dylan rear-facing in the Britax Advantage at 1 year, 5 months old.. Dylan is 32 inches tall and weighs 23 lbs. 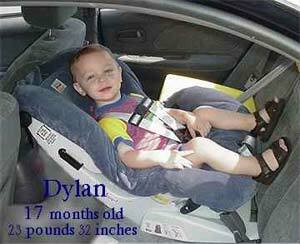 About a month after this photo was taken, Dylan was turned forward-facing because he was too tall to be rear-facing in the seat.